Viobo Access to MSSQL Data Migrator Bus. - Seamless data migration from Access to MSSQL. 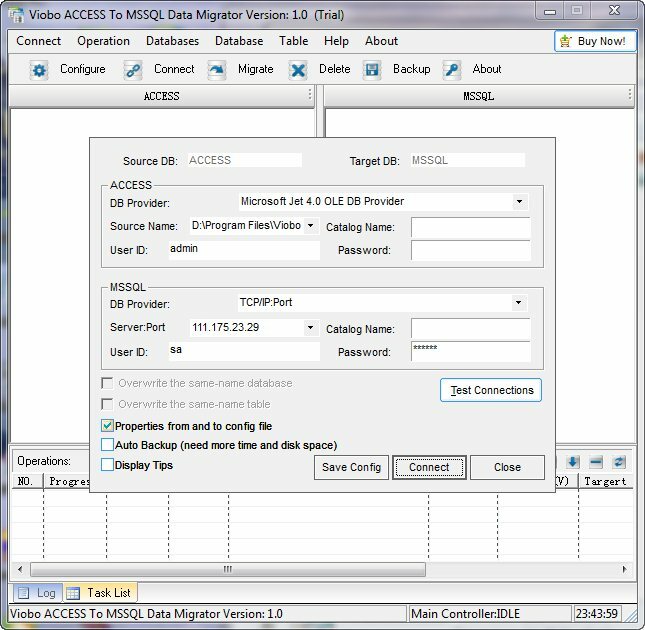 Viobo Access to MSSQL Data Migrator is the simplest data-migrator between Access and MSSQL currently. It migrates data from Access to MSSQL database system accurately and perfectly, with NO database administrator experience required. The tool is compatible with most major versions of MSSQL and Access, including SQL Server 2000 to SQL Server 2008, Access 2000 to 2007, etc. The tool needs odbc or oledb database provider without official client software. The Data Migrator supports the all connection types of MSSQL and Access very well. It can excute SQL Script, Stored Procedure and Function of your database system in Conditions Test simply; and help you administrate databases. Viobo Access to MSSQL Data Migrator display databases as Tree-structure. Users can drag and drop objects between two Tree-Form to operate data in multi-dababases from one to another. User can operate Views, Indexes, Primary Key, Foreign Keys in Access without other Client Software, and can manage data structure in Access simply. The user-friendly interface helps user operate the data of databases easily and get its effect in real time. The User can also backup the data of Access .mdb file into Data-Files with the TEXT format in user defined directory. Tasks-Queue and Multithread-Management mechanism of the tool can enhance speed of migrating and keep integrality of the mass data. In the Tasks List, User can sort, delete, stop/start and clear all waiting tasks. Beginner of database can operate databases like operate files in Resource Explorer in Microsoft Windows. A database expert can define the SQL Script, Stored Procedure and Function himself to complete the advanced migration operations. Viobo Access to MSSQL Data Migrator can also process multiple tasks at the same time; export data to several frequently-used file formats, including Text-file, etc. The tool also helps user to define operation conditions to make the migrating tasks pertinent and make the result data optimal.